When the Cariboo Gold Quartz mine opened early in 1933 a survey of the Townsite of Wells was done by Major E.J. Gook. The first two lots, on the corner of Pooley Street and Sanders Avenue, were sold by the Townsite Company to entrepreneur Paddy MacDonell who built the Wells Hotel on the site. The Wells Hotel is the largest and most imposing building on Pooley Street, and is the centerpiece of the main street. 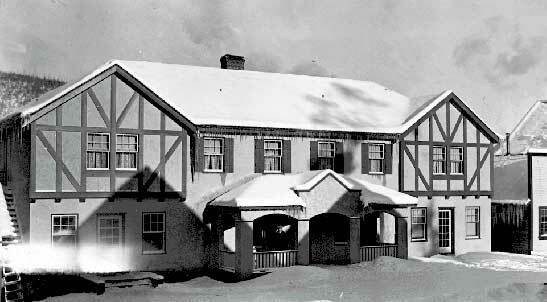 It is thought to be the first building in the Cariboo designed by a qualified architect, and was completed in 1934. It contains three fireplaces faced with ore from the three mines visible from the windows of the hotel: the Cariboo Gold Quartz; Island Mountain Mine and the Coronado. Materials from all over Europe and California were used on the walls and floors. The hotel was completed late in the fall of 1934, and a huge opening party was held at the hotel on the evening of November 13, hosted by the owners, Paddy and Mrs. MacDonell. For this special occasion the electric power supplied to the town was turned on for the first time. 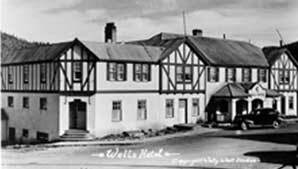 The hotel contained the first beer parlor in Wells, and became very popular with the mine workers, especially on pay day when the hotel owners would cash the mine workers cheques. A popular story regarding the Wells Hotel is that the price of a beer at that time was 5 cents a glass, and since Paddy MacDonnell had the only beer parlor in town, it wasn't long before he began to assume that the miners would buy beer at any cost - after all, they were making big pay! When Paddy doubled the price of the beer the miners were very angry. Although they continued to buy beer, once their glasses were emptied, they flung them into the fireplace, smashing them into a thousand pieces. Eventually, but not before every glass in the hotel had been destroyed did Paddy put the price back to 5 cents a glass. In 1939 the hotel was enlarged with an additional 8 rooms with private baths. The beer parlor, or as it was sometimes called, the "beverage room" was also enlarged. The MacDonells sold out in 1961 to Art and Olline Smith. By December of 1970 the Wells Hotel had been sold to Keith Pelletier, who operated it until 1978, when it was sold, but later returned to Pelletier when the sale fell through. Later owners were George Leslie, who did a lot of work on the then vacant building, the Schmodes, and then Barbara Wilson, and artist from Victoria, who had originally been sent up to Wells to do "as found" drawings of historic buildings in Wells. While Ms Wilson accommodated some guests in the second storey of the hotel, she was also attempting to restore the building. While the Wells Hotel has seen many changes in ownership and several renovations in its long history, it continues to be a significant landmark in the town, offering an air of stability and culture to the fast growing arts community that Wells has become31. In November 1997 the owners of the Wells Hotel applied for a destination casino. The approval was finally granted in May of 1998.The owners of the Wells Hotel hope that the Jack of Clubs Casino, as it will be called, will be operating by the Summer of 2001.